And trust me it is so so tempting to just sit down and read all of your blogs instead of unpacking these-so I will start to be around sporadically this week-but I really need to keep getting my life out of boxes! But I did type a little something up for a guest post today. Yep, I am guest posting at MiMi's of Living in France--yes the same MiMi that guest posted on my blog on Friday. That is a great idea for a guest post! Your pictures are amazing! Love the ones with your kids and the balloon. Too cute! I love how you prioritize. You must have a million things to do and here you are guest blogging! That pic is so fun! Good luck unpacking!! I love that picture! Off to check out your guest post! Great post! Here AND over at Mimi's! That picture is so cute!! I love it! We're looking at moving again in the next few months! I'm not looking forward to the boxes! He just looks like he is having a blast up there. hahaha. so funny. Gorgeous pictures, as always! 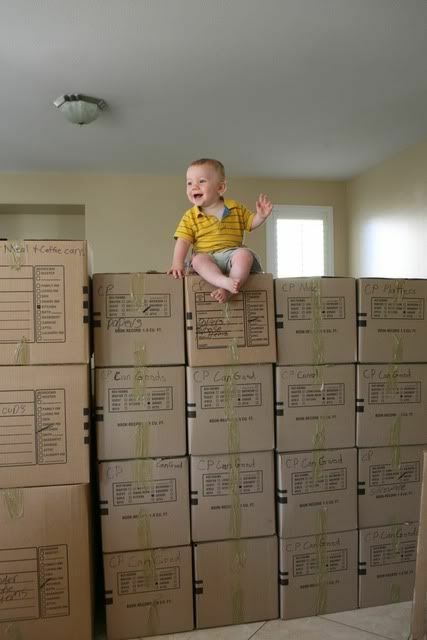 Good luck unpacking all those boxes...ugh, I feel for you! Cute photo ... he looks like he is having so much fun. I'm sure you are not having that much fun ... just take your time! EEK! Them be a lotta boxes! Did you have somebody pack you because those boxes are just entirely too orderly and size matched? Mine were a freakin' mess! Glad you're in the new home, but I know how overwhelming the unpacking can be! Holy boxes, Batman! Good luck getting those unpacked! Your pictures are fabulous. Good luck with the unpacking!